I enjoyed reading through the article as it showed what could be done more easily with the help of a folding bicycle. 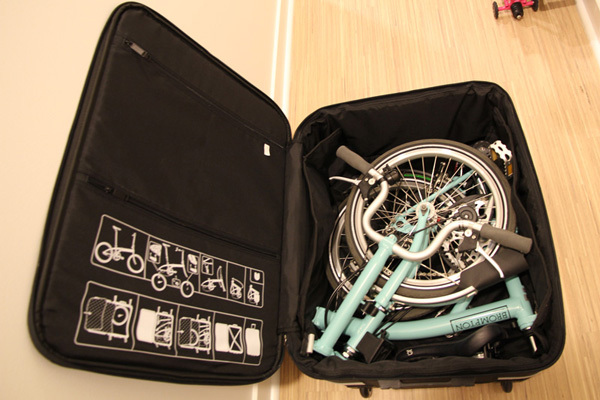 Now granted, the Brompton has a very small folded size but it amounts to just a smidgen under three cubic feet therefore two would not fit in a three point five cubic feet trunk. Folding the rear seat would be the only way to get two Bomptons in a Scion IQ reducing the car to a two seater with some more luggage space available. You are right. When I read the specs on the website, I directly took down the number without thinking. Thanks. I will fix it. It’s too bad they don’t have the numbers with the rear seats folded down. Turkish green!! I used to have one when I was in China. I really missed my Brompton. And I just relocate to the bay area, looking for a Brompton. Would you mind sharing some information on bike shops, online forums? Many thanks! Welcome to the Bay Area! The only local bike shop that I know sells Brompton is Warm Planet at the 4th/King St. Caltrain station. The people there are very helpful and friendly. We got our Bromptons from Clever Cycles in Portland when we visited there and tried out in person. I like them a lot (aside their great customer service) for specializing in Bromptons. 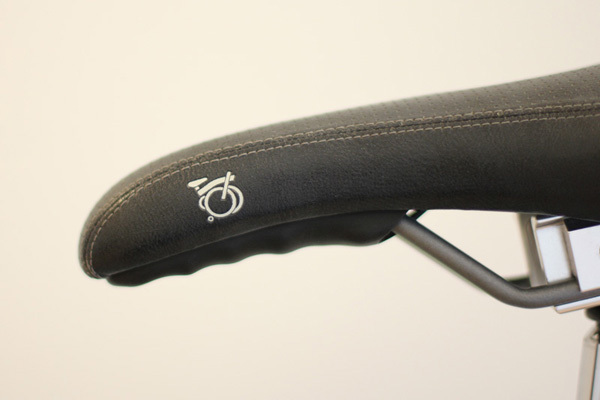 Since you have owned a Brompton before and you already know what it’s like, so I recommend Clever Cycles. The shipping is really cheap at $25 and no sales tax. A online forum that I like is bikeforums.net and look for folding bikes subforum. Tons of info on Bromptons. Nice to see another SF-ian enjoying biking in San Francisco. I also have an IQ like yours and is also in silver color, I sometimes drive that IQ and sometimes drive the Fiat 500 as well, both have enough room for three foldable bicycles with 16 inch wheels, and the Fiat 500 has enough room for three foldable bicycles with 20 inch wheels as well. Just FYI, if anyone is thinking how many bikes to fit for the cars. Okay, I also must say that I have been inching towards upgrading from my Citizen 16 inch foldable wheelers to either Dahons or Bromptons. I and my wife both like the colors of the Bromptons, plus it seems that the 16 inch wheels from Dahons are not very flexible for medium length of riding, says 20 to 40 miles with some uphills and downhills in between. The Dahon 16 wheelers only have either 1 speed or 3 speeds. And the gears are not that tall compared to that of Bromptons. 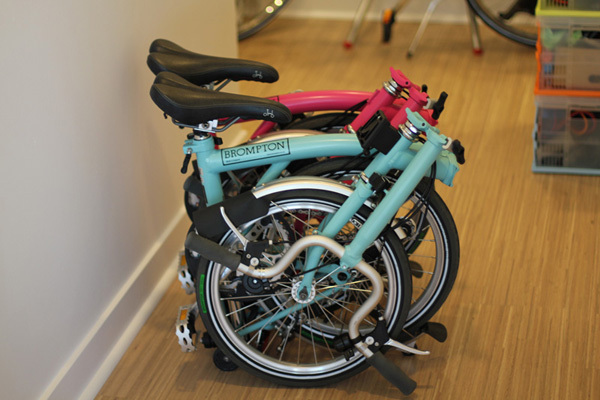 I and my wife most likely will visit the Bromptons licensed bike shop at Palo Alto and purchase from there. Thanks for your great review as well. Enjoy & may see you soon in the city while biking … !! Would you recommend it for unpaved road (light compacted gravel, such as a river levee) or non-well-maintained country roads? I don’t know exactly what you meant by non-well maintained country roads, but I have ridden on dirt roads for a short distance. And my opinion is that if it’s fine for dirt road, it will be fine for anything else. However, I do have a couple of points I would like to add. I think it would work fine if the country road or unpaved road does not have deep and uneven surface because you can get pedal strike. The clearance of the folding pedal side from the ground is only 7.5 cm but if you change it to another pedal like I did, you can get another 2.5 cm clearance. 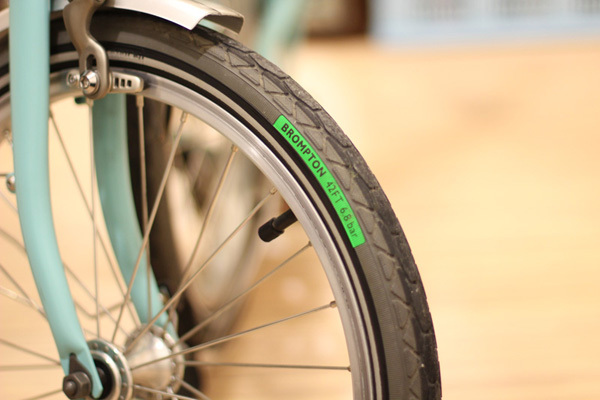 You may also want to upgrade the tires for grips depending on how rough the surface is. PS. By the way, this is how much I love Bromptons. I just ordered two more Bromptons, one for me and one for my wife, just for traveling. The ones I have now weighs at 26 lbs, but it’s very heavy to carry around. So if you think you will be carrying the Brompton around a lot, I recommend the lightest Brompton you can get. Bromptons are best used on paved and “well travelled paths”. They are NOT an off-road bike by any stretch of the imagination. Fahgedaboudit! 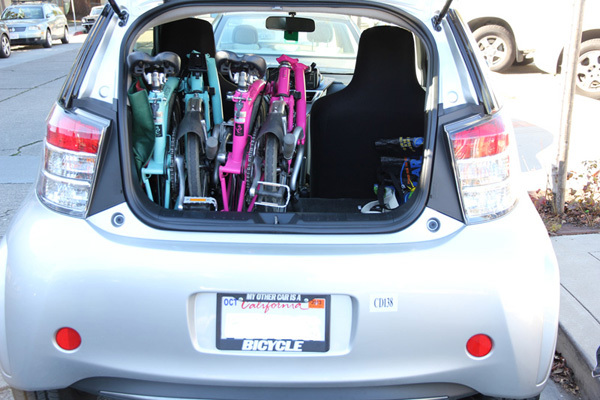 But for commuting, taking along on a trip, or just in the trunk of the car they can’t be beat. 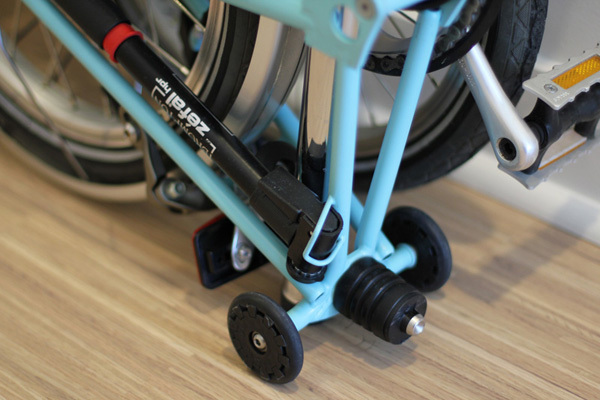 Brompton has redesigned the pump to address this issue. It has come standard with bikes shipped after the summer 2012. It has a larger hole at the end which supposedly holds it more securely. I have used Velcro tapes to secure the pump to the frame more solidly to prevent it from falling off. 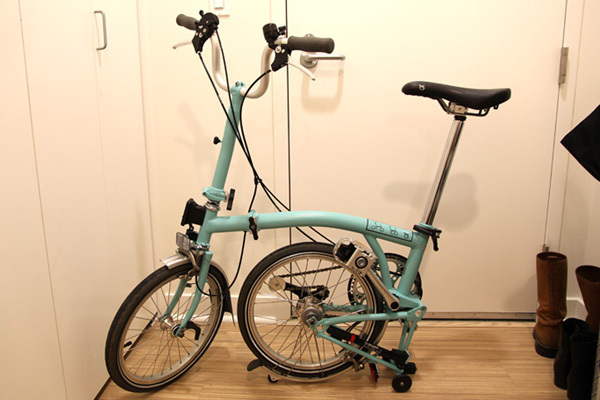 Please could you clarify your information regarding Brompton with rear rack fitting into Tern Airporter Mini ? Thank you for that information. It was Clever Cycles in Portland who sold me the case said it wouldn’t fit, and I relay that message. SF Bike Style – Red brightens any rainy day!